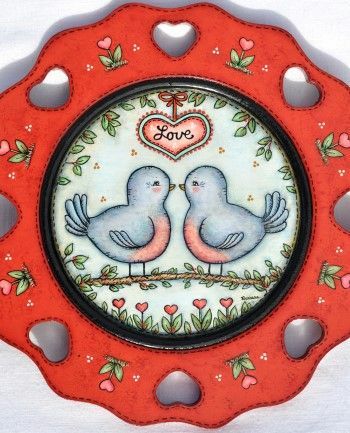 Featuring two birds painted on a wooden plate with a 4 1/4" center diameter and with cut-out hearts around the rim. The design could also be painted on a plate with a solid rim and the hearts painted on. It could also be adjusted and painted on a larger plate, another surface or an ornament.